“Afghanistan has been called the graveyard of empires, but it’s more of a crossroad of cultures,” Fitzgerald said. The cultural richness is what Shorish-Shamley remembers from her childhood. Though she was a Muslim, she remembered attending Jewish holiday celebrations. Hindus, Sikhs, Shiites and Sunnis lived easily with one another, she says. 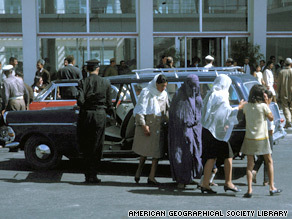 As recently as the 1970s, Afghan women could be seen wearing miniskirts in Kabul. Official Washington is buzzing about “metrics.” Can the war in Afghanistan be successful? Don’t ask the dead. They don’t count. The way the Russian invasion of Georgia was framed by the American media is from the same script that Zbigniew Brzezinski and the American media used to frame the Soviet invasion of Afghanistan. The American media got it all wrong back in 1979 and it’s still getting it all wrong in 2009. Just like the British empire, Brzezinski’s obsession has always been to contain Russia in its own neighborhood and Brzezinski is still pushing the same worn out 19th century British colonial strategy turned 20th century “Cold War” stratgy of containment against Russia in the 21st century!